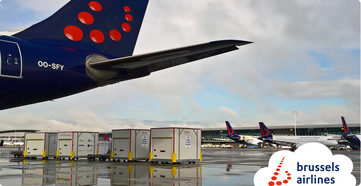 The Belgian carrier Brussels Airlines Cargo, in operation with Brussels Airport’s cargo arm, BRUcargo has come up with another innovative solution for better protecting temperature sensitive shipments being transported to aircraft parked on the apron. 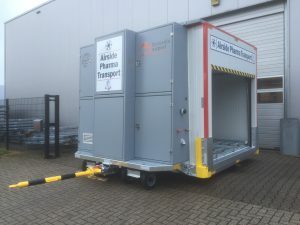 The idea came about already in 2015 and the “Airside Pharma Transporter“ finished product was presented at the TIACA Air Cargo Forum in Paris . Now that, research, development and production have all been completed, BRUcargo is now the proud owner of four of these vehicles. The idea of producing a vehicle which protects temperature sensitive goods on their way from the warehouse until loading in the aircraft was born when the pharma shippers requested the industry to enhance quality improvements throughout the entire supply chain. This also included one of the weak points in the chain - namely the journey between the handlers cooling facility at the airport to the belly or main deck of the outgoing or incoming aircraft. The pharma industry has always had misgivings about possible high temperature fluctuations being experienced throughout the supply chain, thereby affecting the medicines stored and the danger of them not being usable anymore at destination. The Belgian carrier which transports large amounts of this type of cargo has now taken the four Airside Pharma Transport vehicles under their wing and put them into operation at Brussels Airport. Apart from ensuring that the goods remain properly temperature controlled, the shippers get access to real-time data throughout the whole journey. The transporter utilizes a new type of cooling technology and relies on solar powered technology which also allows for an autonomous operation over several days. Another step towards winning back a star of the pharma products presently moving by ocean freight?